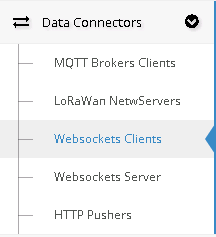 Websocket Clients is placed under the Data Connector menu. - URL*: the URL of the Websocket Client. Differently from MQTT Protocol, Websocket's message isn't split into two parts, infact its directives are represented by a JSON. To recognize the type of the message, there's a JSON field called "Command" that describe the action. The Command description format depend from the Server. ResIOT has some pre-configurated models but if you want to use your own server you have to set the JSon Data Patterns table in Websocket Edit based on the documentation.